The Nesbitt family is a multi-generational farming family who has embraced new opportunities. They have worked to build a business that gives the next generation the opportunity to pursue their desire to farm. They have hosted countless 4-H meetings and have held producer workshops at their farm. They support local fairs where they show their cattle and attend countless agricultural events throughout the year. They are environmental stewards, using minimum tillage practices, cover crops and rotational grazing. In 2010 they received the Ontario Pasture Award from the Ontario Forage Council. In addition to their purebred cattle they crop over 1500 acres, growing a variety of traditional and specialty crops. With two sons and their families now home farming, they continue to develop their marketing strategy and in 2004 held their first annual on-farm bull sale, welcoming buyers from across Canada as well as opening their farm gate to neighbors looking for fellowship and a good lunch. They are proud to be one of Ontario’s largest registered Charolais cow operations as well as hosts of one of the longest running Charolais bull sales in Ontario. They continue to develop new opportunities to grow their farm to support their families. All members of this family are extremely involved in the community volunteering with Lindsay Exhibition, Durham Region Cattlemen’s Association, Ontario Charolais Association, 4-H Ontario and more. The Clarington Board of Trade has formed a truly amazing partnership with the local agricultural community. 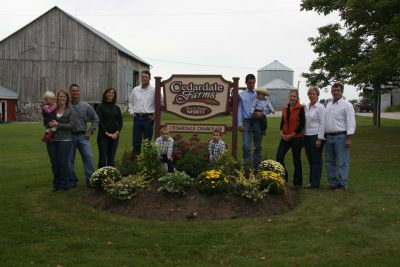 Recognizing the impact that the over 400 farms in Clarington have on the community, they have created an agriculture position on their Board of Directors. They work closely with the municipal and regional governments to promote agriculture and encourage growth. They were instrumental in the formation of a Farmers’ Market in Clarington in 2005 – which runs every Sunday morning from May through October in Newcastle. 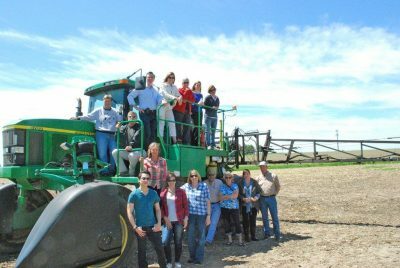 They have hosted Agricultural Familiarization Tours – touring farms in Clarington – for Municipal Council and staff to learn about local agriculture. As well, they host an annual Agriculture Summit which features a small trade show and amazing speakers on topics relevant to the local agriculture industry. Their Barn Door Directory is an online publication listing Clarington’s “Assets in Agriculture and the Food Processing Industry”. The Clarington Board of Trade embodies the Spirit of Agriculture through their knowledge, enthusiasm and promotion of agriculture in Clarington. Nicole Swain is a person whose influence inspires people. She is committed to educating and inspiring Durham Region’s youth on the agricultural industry that surrounds them, sharing the important role agriculture plays in their lives. She is innovative, energetic and passionate about science and agriculture and has presented workshops to her colleagues on Cultivating Ideas to Teach Agricultural Science and has conducted a workshop at the Science Teachers of Ontario Association Conference in Toronto, providing teachers with resources and a practical understanding of agricultural science that they can bring back to their classrooms. Nicole was instrumental in the development of the Farm Connections High School program, serving as committee chair for a number of years. Because of her connection to the school system, and her passion for teaching others about agriculture, the program has continued to grow inspiring students to consider careers in the agriculture industry. She volunteers at her local fair, is a member of Durham Farm Fresh and has been a leader of Durham East 4-H Beef Club. 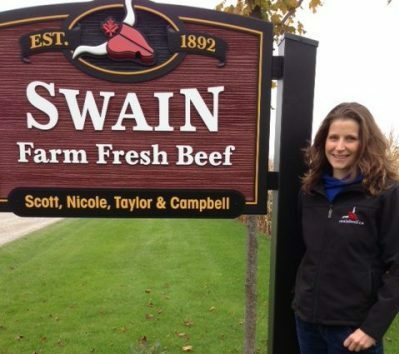 Nicole and her husband Scott and their children are beef farmers, and market their meat through their online store swainbeef.ca. They also grow corn, soybeans, wheat and edible beans. They pride themselves on being good stewards of the land, making environmentally conscious decisions as they run their farm. Ontario is home to incredible farms, chefs and retailers producing and using fresh, local products. We are passionate about getting fresh, healthy, affordable local food from our family farms to your family table! Get to know your farmer, they take pride in the work they do for you!